Made of strong, rectangular aluminum tubing, the Cemetery Church Truck features a protective gloss anodized finish that keeps the truck looking new and makes it easy to clean. 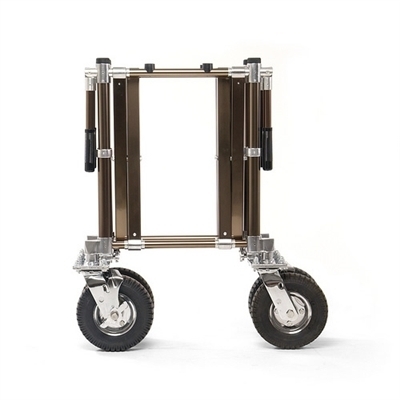 The stable x-frame undercarriage and rubber bumpers help to secure the casket. 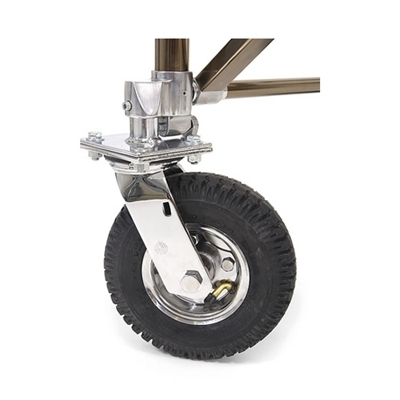 Large eight-inch pneumatic wheels roll easily over grass or rough terrain. 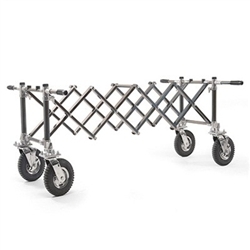 There are four swivel wheels for greater maneuverability and two wheel locks. When moved without a casket a special built-in center handle allows the truck to be pushed, pulled or carried. Includes for side handles for lifting over curbs. The Cemetery Church Truck locks into four positions, allowing a wide range of casket sizes to be displayed with one truck. The additional length increases stability and makes an attractive appearance. 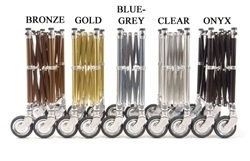 Available in onyx, blue-grey, silver, bronze, or gold finish. Fully Extended Length: 61-1/4"L x 20-3/4"H x 21-1/2"W.